Your new garden of ideas will need a name. To call out your service to the entire world, to feature your work and place yourself in the grand and glorious realm of design, you must make a mark. Think of what it is that you wish to do. What are you trying to accomplish? Create a mission and strategies for achieving that mission. Design the title from which you will bring your name, place and contact information to life through real and virtual channels. Create an image that will become one of your portals to the world. Your title and your business card will be how others shall come to know you. Collect 10 different business cards from friends and family. Study the design, information and ideas being promoted. How easily does the card read? Are you able to tell what the company does? Do they make use of color or is the card black and white? What type of font is used on the typeface? Are there photographs used as graphics? Next, ask yourself how you can improve each design. Compare your observations with your friends. Finally, be sure to record your notes in your journal along with the sketches and design changes you would make. Do the research before creating your own business card. 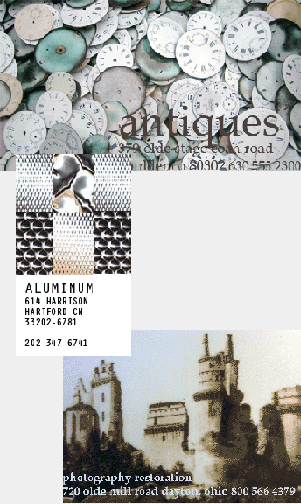 Become a business card collector! 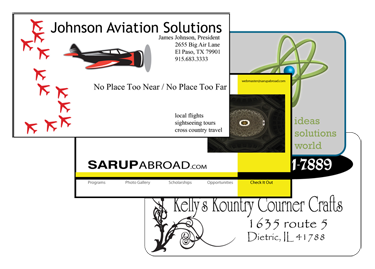 Make your first business card three times larger (6” x 10.5”) than the standard card (a typical card is 2” x 3.5”). 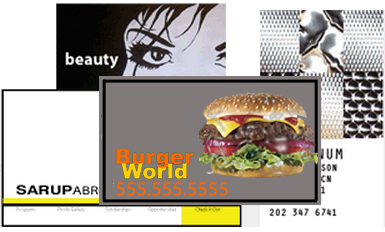 If your design includes printing from a machine, hand drawn colors or art work that bleeds off the edge of the card be sure to start with a larger size card that is 3.75" x 2.25" to allow for trimming. A typical bleed area is usually an extra 1/8” on each side. Both design styles work great; create at least one card with a bleed and one without. You can design a flat card, tent card or even an origami card; don’t be afraid to push the limits of your design. As you become more adept at creating different cards, it is a good idea to create three possibilities for a business using different graphics, color ranges, and imagery. By studying the three cards and discussing their appearance and message with friends, you can develop the best card for the business! Be certain to include your name, title, phone number and the name of a company that you choose. Make up a business with information that reflects the dream job you will have when you are done with school. Include graphic images and pictures that may relate to your business. Always make sure that the information is clear and easy to read. Submit your card to the gallery. Many companies are attempting to green their business practices and services to help a company appear environmentally friendly. Take a look at advertisements in your area. Scan through design magazines to see what colors most of the advertisements are. Compare the number of green colored ads in your magazine to the number of non-green ads. What is the percentage of difference? Are there more green ads this year than last year in the same magazine? Pick a company (or make up your own) and create a business card. Concentrate on what actually makes the company green. Is it a green building, a green service, or a green carbon neutral company? To ‘green’ a business means to enter into it using less energy, reusing waste material, connecting locally, and advocating change to a more responsible relationship with the environment. Ask a printer what constitutes 'green printing’. Think about printing on recycled paper. Think about using environmentally responsible inks! How can you communicate green? 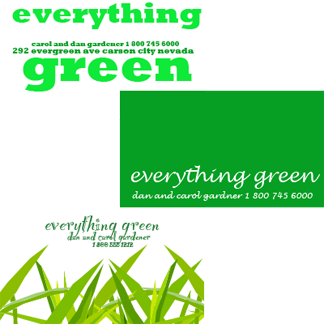 What makes the color of green the greenest? Business Cards serve as advertisements. Graphics are a major part of the first impression.